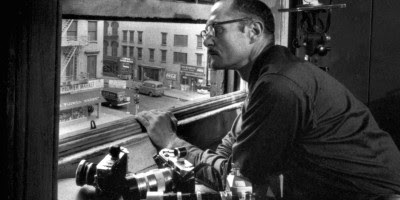 Portrait of W.Eugene Smith a photographer for Life Magazine who recorded both on film and audio tape all of the goings on in the loft and building he called home on 6th Avenue where the greats of Jazz came to jam and rehearse. Not so much a portrait of the music but of the man, JAZZ LOFT is a glowing portrait of a man who was not only one of the best photographers of his time but a man who loved music. As his son says about his dad music was playing in his house pretty much 24 hours a day. The film is filled with lots of talking heads, thousands of photographs and seemingly endless audio recordings of the music and conversations that were happening in the building on 6th. There is so much here that I want to see the film again just to catch everything I missed. I also want access to all of the surviving recordings just to see what sort of goodies are contained on them. There must be days worth of killer jazz recordings. This is one of those rare films that actually transports you back to a particular place and time because it has actually has recordings of that place and time.